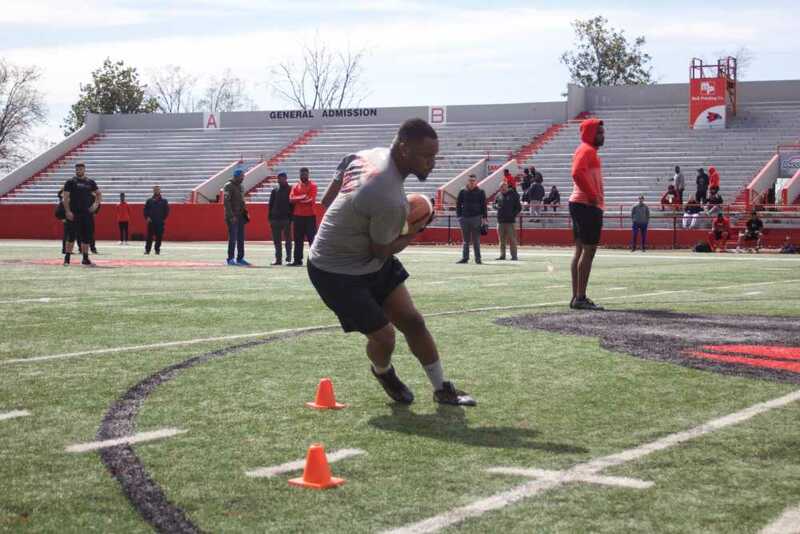 Senior running back Marquis Terry cuts between cones during a position drill at Southeast's pro day on March 26. Southeast’s 2018 football campaign broke new ground and brought the university countless awards, but there may still be more to come for a handful of seniors that participated in a pro day at Houck Field on March 26. 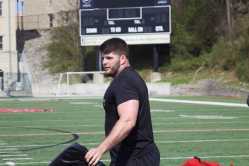 Among five Redhawks participating in the pro day was offensive lineman Drew Forbes, a three-year starter who has been on the radar of National Football League scouts since the summer. Forbes, who participated in a pro day at Missouri Western just a week before, improved across the board, most notably knocking his 40-yard dash time from a 4.98 to a 4.90. The fastest time among offensive linemen at the NFL combine a month ago was 4.89. Senior offensive lineman Drew Forbes prepares to hold a bag for position drills during Southeast's pro day on March 26. Those other seniors included fellow All-American running back and Ohio Valley Conference Offensive Player of the Year Marquis Terry, defensive lineman Reggie Miles and linebackers Demarcus Rogers and Marcus Goree. The group also included Missouri S&T linebacker Landon Compton. The test of athleticism began indoors at 9 a.m., where all players conducted the bench press and vertical leap. Afterward, the group moved outdoors to do the broad jump, 40-yard dash, shuttle and other drills, including positional work. 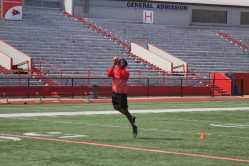 Senior linebacker Demarcus Rogers catches a pass during position drills at Southeast's pro day on March 26. Heading into the pro day, both Terry and Forbes knew what to expect. Forbes earned a plethora of honors following his senior campaign, including several All-American honors as well as being named Phil Steele’s Football Championship Subdivision Offensive Lineman of the Year. His efforts the entire season helped pave the way for Terry, who ran for 1,229 yards, including an OVC-record 311 against Southern Illinois University on Sept. 15. Terry finished with 1,625 all-purpose yards. Due to lingering ankle and knee injuries, Terry was limited to just the opening series in the Redhawks’ loss to Weber State in the second round of the FCS playoffs. Terry and Forbes both noted they had spoken with a few of the scouts before, and did so after the pro day as well. Forbes said he already had several interviews with NFL representatives and expected more going forward. The senior Redhawks — as well as Compton — are trying to follow the footsteps of former Southeast players Kendall Donnerson and Mike Ford. The former was drafted in the seventh round by the Green Bay Packers last year and the latter signed as an undrafted free agent with the Detroit Lions, where he played in seven games and recorded 24 tackles. Among the eight NFL teams at the pro day were the Los Angeles Rams, Cleveland Browns, Dallas Cowboys, New York Jets, Detroit Lions, Arizona Cardinals, Buffalo Bills and New Orleans Saints. Rogers started for Southeast and finished the season with 81 tackles, good for fifth on the team. Miles and Goree were spot starters for the Redhawks. In less than a month, the players will find out how much they impressed the scouts. The NFL Draft is set to begin Thursday, April 25.